Fish rolls made from sole fillets stuffed with shitake and drizzled with black bean sauce. An elegant dish for any occasion. 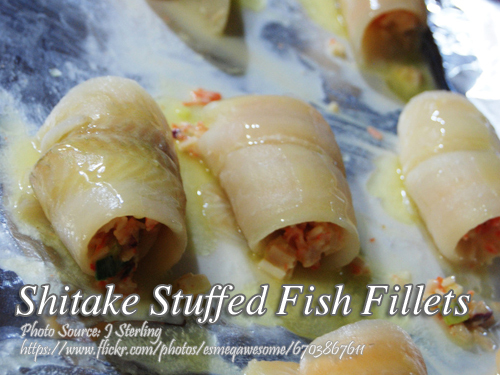 If sole fillet is not available, you can use cream dory or any white flesh fish. To cook Shitake stuffed fish fillets; Soak mushrooms in boiling water for 30 minutes. Drain.Cut off and discard mushroom stems. Slice mushroom caps finely and set aside. In a heavy, medium-sized non stick skillet over medium heat, saute ginger and garlic in oil for 30 seconds. Add button mushrooms and saute until almost dry, about 8 minutes. Add shitake mushrooms and cook 1 minutes Remove from heat. Stir in soy sauce and sesame oil. Set aside. Place 1 fillet flat side down on work surface. Place 2 tablespoons filling across widest short end and roll into a cylinder. Repeat until all fillets are filled and rolled. Arrange fillets seam side down in 9 inch glass pie dish. To see complete recipe, continue reading.